The ABC Mini Book is a blank ABC booklet that you can use for a variety of projects. It only takes two sheets of paper per student and takes much less time to complete than ABC projects requiring a full sheet of paper for each letter of the alphabet. 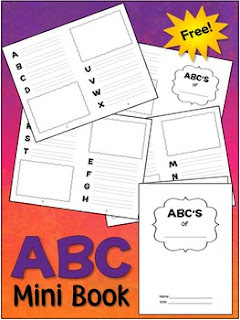 You can use this template in almost any subject area to have students create thematic ABC booklets. Assign a topic or theme such as "healthy habits" or "The Civil Rights Movement," and have students think of one word for each letter of the alphabet related to the topic. They define the word or explain how it relates to the topic and illustrate one of the words on each page. This booklet works well for state or country reports. How do you plan to use this? Please rate it and leave a comment for us. Thanks! You can also download the free ABC's of Me booklet here on TpT.